Choosing to install a staircase is a major consideration for many Devon homeowners whether it be part of a renovation project or new, self-build project. Not only a functional part of any property access, a beautiful staircase can also become a stunning focal point within the home as it is often the first thing people see when they enter through your front door. 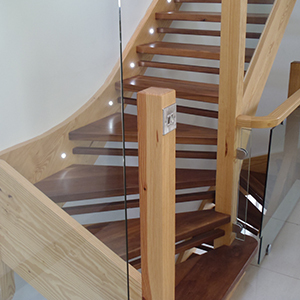 A range of experienced Devon joiners are on hand to help create the stairs of your dreams, which will last for many years to come. Here's a quick guide on how to create a stunning centrepiece within your budget and the key things you should consider when planning to design and install a new stairway within your home. 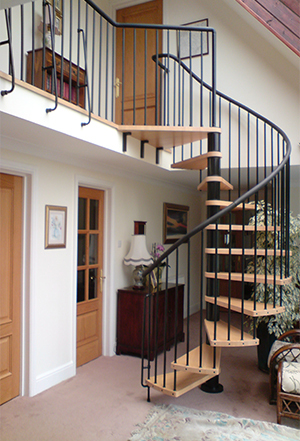 Wherever you are in Devon, if you are looking for a staircase with a real wow factor that gives the sense of grandeur when you enter your home and you have a realistic budget in place, there are various options view to choose from. There is no greater luxury than choosing a solid oak structure within your Devon home as oak offers undeniable strength and durability and above all and truly reflects the traditional qualities of English craftsmanship. contemporary style staircase is another great way of making a statement. By mixing materials you can help modernise the design to achieve fantastic results. Connecting the solid smooth lines of oak with steel or black iron spindles means you can create a sleek look within your budget, with fantastic results. "Choosing the stunning centrepiece for you and your home"
If of course you choose to opt for a traditional designed staircase but cannot afford oak, choosing Hemlock, a softwood evergreen or engineered oak, are great alternatives. These materials allow you to apply a range of stain or paint finishes that will instantly add a touch of colour to your project. By adding a touch of glass into your staircase you will allow more light to travel through your home, giving the illusion of increased space and making the whole area more light and airy in feel.